WASHINGTON CITY — An elderly woman was transported to the hospital with serious injuries late Saturday night after being struck by a vehicle while crossing Telegraph Street. She ultimately succumbed to the injuries. At approximately 11:30 p.m. emergency responders were dispatched to an incident at 1036 W. Telegraph St. involving a pedestrian who was reportedly struck by a small passenger car while crossing the street, said Ed Kantor, public information officer for the Washington City Police Department. Upon arrival officers found the woman lying in the roadway severely injured, Kantor said. 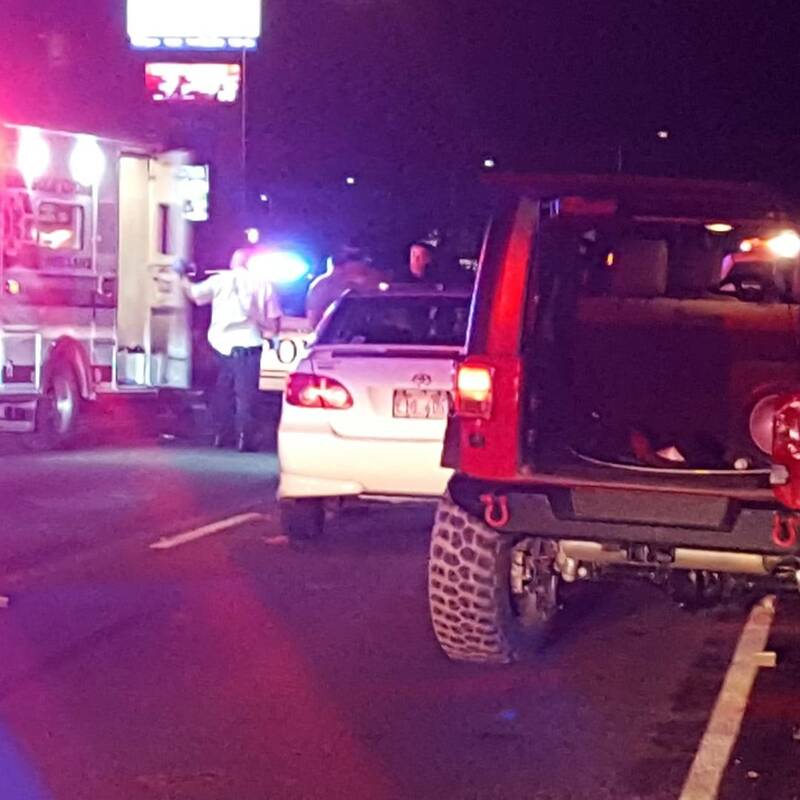 After being treated at the scene she was transported by ambulance to Dixie Regional Medical Center in St. George, he said, where she later died from her injuries. Officers investigating the crash determined that the woman was not in a crosswalk at the time she was struck by the vehicle, which was traveling west on Telegraph Street, Kantor said. It had been raining heavily earlier in the evening, but not when the incident occurred. Kantor said that the 19-year-old driver showed no signs of impairment, and officers found that speed was not a factor in the crash. 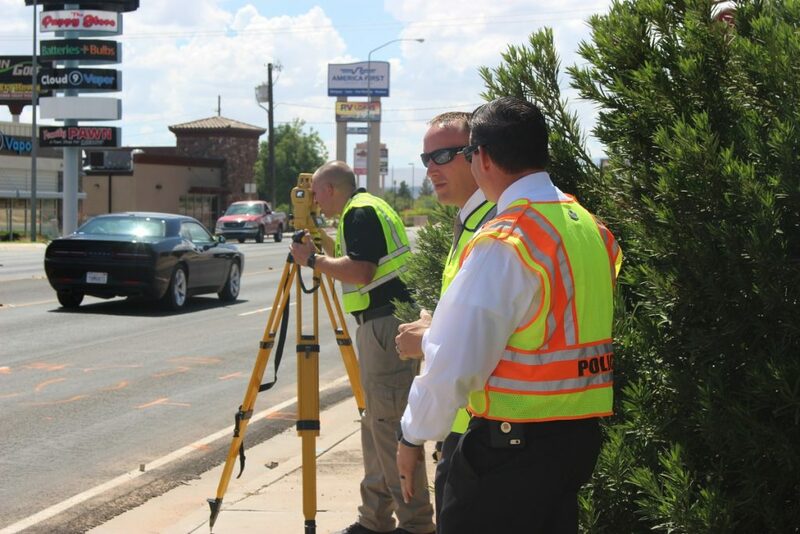 On Sunday afternoon Washington City Police officers and investigators were back at the scene of the crash and were joined by Utah Highway Patrol Trooper Chris Lewis, an accident reconstruction specialist. 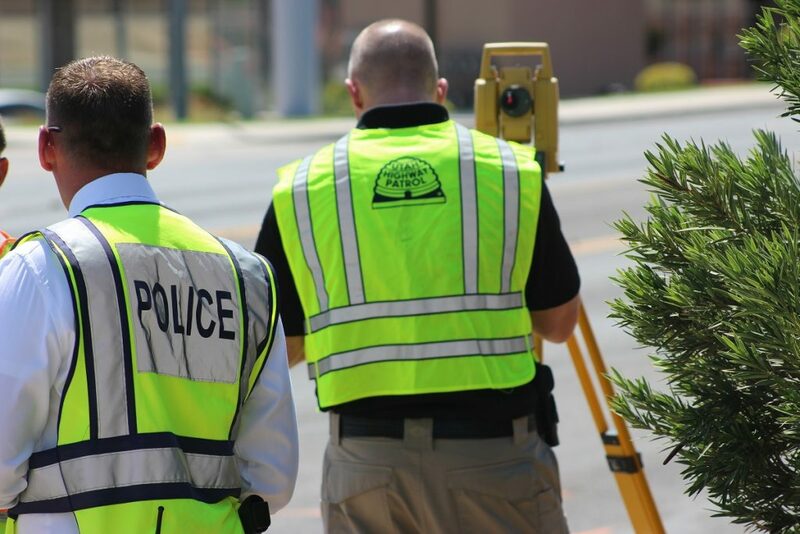 Lewis performed a scan of the area using 3D laser scanning technology that creates a precise 3D model of the scene and preserves crash scene data that can later be used for analysis or to reconstruct the scene later. 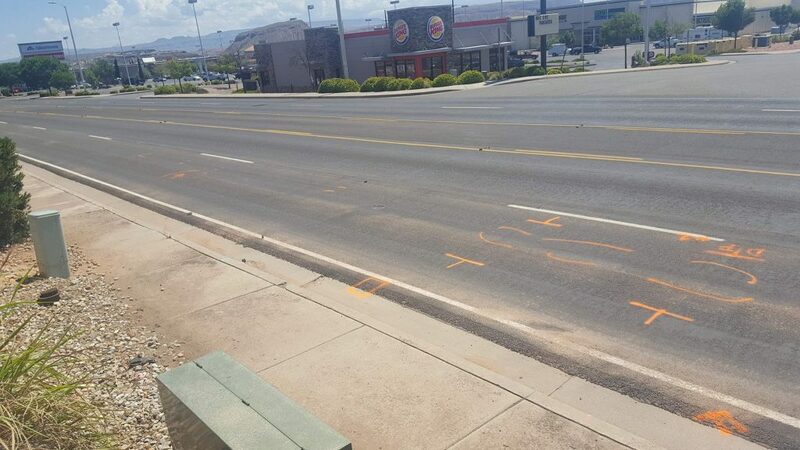 Kantor said it is not unusual for the Utah Highway Patrol to conduct an accident investigation on incidents involving a pedestrian versus a vehicle, particularly one that ends in serious injury or death. “This is an ongoing investigation, and officers are trying to analyze all of the details associated with the incident, so this is preliminary information at this point,” Kantor said. Notwithstanding the tragedy of this crash, one must ask, would the Google car have stopped in time? What if there was a way this driver could have started the braking ¾ of a second sooner and stopped 30 – 40 feet shorter, perhaps in an even shorter distance than the Google car. There is. Sad that those in charge of driver legislation and training refuse to teach student drivers the safer left foot braking method and ban driving instructors from teaching the very complicated and difficult to mentally maintain especially for older drivers, inefficient(poor stopping distance) and dangerous (right foot pedal errors) right foot braking on automatic cars. See DOT HS 811 597 and 812 058. NHTSA insists on calling it “pedal misapplication” and always blames the driver rather than their beloved right foot braking method. Score to date 30,000 – 150,000 dead, millions injured, and billions in costs. The price men both in and out of government are apparently willing to pay to maintain their systemic belief in right foot braking on automatic cars even though they have zero scientific justification. As one transportation “expert” said “That’s the way it’s always been taught”! This is not about who has the safer braking method but rather why they refuse to scientifically compare the two methods! A more simplified explanation would be this: At 11:30 PM (almost midnight) a woman wearing dark clothing crossed the road 800 ft west of a well lit and marked pedestrian crossing. She was struck by a car that wouldn’t expect a pedestrian at that location. End of story. NO scientific facts necessary. Cars are not designed for left foot braking. You sound like a lunatic. Hopefully, this young driver will not be punished for what appears to be a true ‘accident’. Our society is far too eager to imprison people for minor offenses or perceived ones; yet give a few short years for murderers and violent offenders or none at all over and over. I was returning home around the same time this happened. Rain or not, it was dark and wet enough to not see someone suddenly crossing a street wearing dark clothing or not. Especially not a usually lit crosswalk. Prayers for the family of the deceased and this young driver. This could have happened to any of us under the same circumstances being the driver. I have had my share of close calls with people wearing dark clothing in the roadway. My heart goes out to this young driver! No matter how this turns out legally, that driver likely is going to have to live with this for the rest of their life. And where did you ever get the idea that “two foot driving” is a good idea? What actually happens when people use both feet to operate the pedals, is that the left foot, sooner or later, is going to rest on the brake pedal. When this happens, the brakes are applied slightly, which heats them up. The result is that when you do try to apply the brakes, you will have reduced braking because they are hot. This is why Driving Instructors, if they know what they are doing, teach right foot driving only on vehicles with automatic transmission. Go through any emergency vehicle operation course, and they teach you to lock that left foot against the left front of the driver’s seat. Feel terrible for all involved, especially the young driver who will have to live with this forever. I guess the real question, why is an elderly woman crossing the street alone in the dark close to midnight? Would the author define elderly please. This elderly woman was my mother. She was NOT crossing alone at midnight in the dark. She was walking her enormous beloved white/cream coloured dog. She had a recent hip replacement and couldn’t walk fast or far. She was almost across the few lanes of traffic and her dog was struck first. She was wearing blue jeans she was not in all dark clothing and her very large ! dog would have stood out. I would think if driving with due care and attention, as the law requires, one might hope the driver would spot an object in the road and have time to brake in most road conditions. Unfortunately for my mother this wasn’t the case. She was careful about crossing the road as she knew her limitations and wouldn’t risk her life or that of her animal. I realise the young driver must live with killing someone but so should all of us who get behind the wheel of a motor vehicle and end someone’s life. At the end of the day a life was lost and a family devastated. I have some mobility issues so I rarely cross roadway traffic even during the day & I never cross streets at night . but Also how everything is affecting others , in particular . . . night driving is challenging for everyone . they are most likely very tired workers trying to focus in bad lighting . I just hope more of us elderly broaden our view so as to make our lives safer . SL, I’m really sorry about your mom and her poor dog, that’s just aweful. Wish they would make more facts known in the story before publishing. I was just going off the story I read. Once again my heart if with you and your family.